The word "water" kept showing up in unexpected ways this year. I think it began with this mug from The Universe Knows that I chose for myself when I gave them at the Pen & Paper Retreat in March. 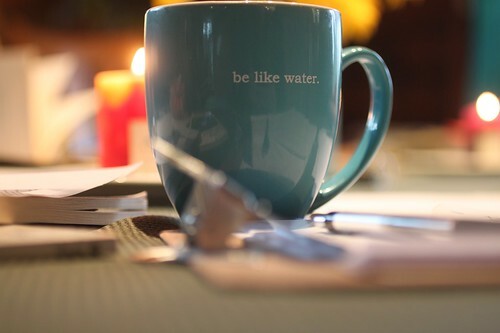 I started to think about what "be like water" could mean and why I was so drawn to the phrase. I kept picturing the way water flows in a creek through the middle of the woods as it turns and gathers small bits of things to carry downstream. It brought up the idea of creating space to invite in more ease and be open to the flow of things, especially things that are out of my control. But of course water isn't always full of ease. There is the unpredictable power of the force that is the ocean. Standing at the edge of the ocean this summer while looking at layers of flotsam surrounding me, I had an image of the ocean as a womb that holds more than one could ever understand. Kind of like a woman. As I stood at the edge of the Pacific Ocean that day, I held hands with fear and bravery and made the choice to open up to an image of home while the waves crashed and the wind blew my hair and favorite green sweater. Then there are the ways that I have felt parched this year. My body, my heart, my mind, my soul. Through the deep realization that I choose whether I water these parched parts of me came a new kinship with the word water. And it guided my decision to create a new series of programs with the theme "Water Your Soul." In the last few weeks, the idea that I should claim this word as my teacher and guide kept tapping on me. I started brainstorming all it might mean: sea, space, salt, wave, parched, blues, flotsam, flow, lemon, quench, seaglass, womb, whales, kindreds, circling, mighty, ease, depth, courageous, lifeline, wandering, the earth's rhythm, the way home. As I look to 2013, this is what I know: I want to create even more space within my home, my mind, my business, my family. I want to quench my unspoken desires. I want to invite in ease and trust the flow of things. I want to own all that rests inside me. I want to unearth my own unexplored darkness. I want to nourish and reconnect with my body. I want to spend more time with mother ocean. I want to find the rhythm of my own tide within. So I'm going to spend time with water this year. I'm opening up to what it has to teach me as I navigate whatever is to come. Are you choosing a word or phrase to guide you in 2013? I would love to hear about your word and why you are choosing it. Please share in the comments or send over an email. 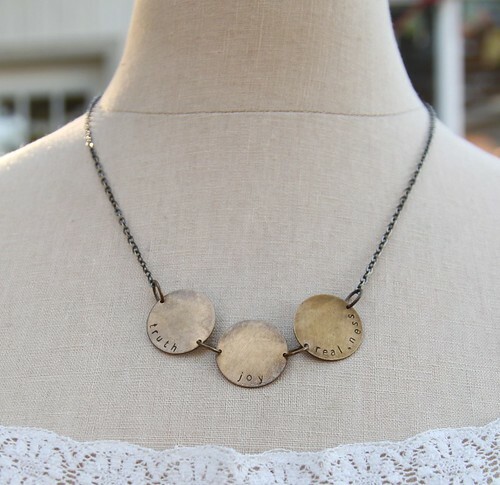 I am also excited to share that I've added a few new customizable options in the shop that would be beautiful talismans for your word or mantra of the year, including this new three circles necklace that can hold words from past years or multiple words or a short phrase. If you are still looking for your word and feel drawn to choose one, think about doing the exercise I shared yesterday without a word in mind. You could just start writing, "2013 was the year I..." and see what surfaces for you. You could also explore the growing list of words and stories over on Ali's blog. So much inspiration found there. Or you could listen to my recording of the 2012 words over on Ali's site to see what word(s) taps at you. And I feel moved to share that I am a "word person," so this exercise deeply speaks to me. I love words. I want to eat them with a spoon. And when I read poetry, sometimes I do actually feel like I'm devouring them. However, this practice might not speak to you. That is okay. Maybe there is a piece of art or song or quote that you see as a guide for you right now. Maybe there is a blessing, a prayer, a poem that you plan to reflect on daily or monthly. You can use this exercise as a jumping off point for so many ideas. My intention with this practice is to give myself an access point for self-reflection each month. Working with the word "whole" in 2012 really pushed me to live deeper and wider and be less stagnant. I work with several mantras at any given time and often choose a new one at the beginning of a season or when something is shifting in my life. And taking the time to choose one word at the beginning of a new year just feels right for me.